Do You Have A Magic Swing? Do you have Magic in your garden? Do you need Magic in your garden? No, I don’t mean garden gnomes. Magic – the kind of magic you get from a magic swing. What is a magic swing? 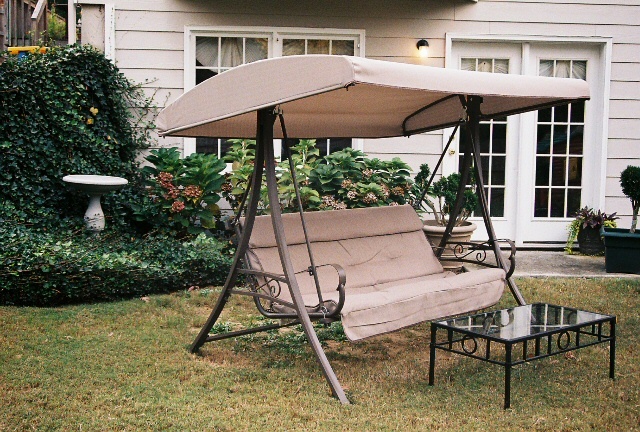 It’s a swing in your garden that gives you the permission to sit and do nothing. Do nothing but look around and enjoy your garden. Everyone should have their own Magic Swing. A very popular gardening magazine recently took a poll and found that gardeners rarely sit in their garden and enjoy what they’ve created. What dummies we are! We spend so much time creating beauty and so little time enjoying it. I have installed a swing in my yard that my son and I call “the magic swing.” We call it this because when you sit down, magic happens. You relax and forget the stress of the day. I try very hard, even in the middle of a busy spring, to sit and enjoy what I have created in my garden. So stop mowing, pruning, and weeding – at least for a little while – and sit in your “magic swing.” Gardeners are magicians – we take barren soil and turn it into a beautiful painting. My complements to you, the magician and artist! Have fun gardening! This entry was posted in Uncategorized and tagged garden, magic, magic garden, magic swing, swing by Sheila @ Redhead Garden. Bookmark the permalink. I have had my son look at the site through the latest version of Firefox and there isn’t any issue. I’m not sure what’s causing this. Thanks for the heads up, though!